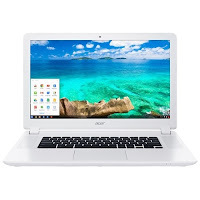 The ACER CHROMEBOOK CB5571C4T3 is a laptop PC which is packed with the processing muscle of Intel Celeron 3205U an entry-level, ULV (ultra low voltage) dual-core processor based on the Broadwell architecture that features 2 MB level 3 cache and runs at the clock speed of 1.5 GHz without Turbo Boost technology. It has an integrated graphics controller dubbed HD Graphics (Broadwell) that offers 12 Execution Units (EUs) clocked at 100 - 800 MHz and capable of rendering high definition movies and playing less demanding games with ease. The ACER CHROMEBOOK CB5571C4T3 laptop PC comes with display features such as 15.6" LED display with Acer ComfyView technology that reduces reflection and 1366 x 768 resolution. The resolution in this laptop PC is not that high so it is expected that the display in this laptop is not that sharp and clear compared to laptop PCs with higher resolution. It comes in white finish for stylish look. The ACER CHROMEBOOK CB5571C4T3 laptop comes with 2 GB system memory for advanced multitasking; 16 GB solid state drive (SSD) – quite limited capacity; Chrome OS keyboard which provides handy one-touch function keys. Fully clickable touchpad with click-anywhere functionality and support for one-finger left click, two-finger right click, and two-finger scrolling; built-in webcam with digital microphone; built-in stereo speakers; built-in media reader for simple photo transfer that supports SD memory card format; and lithium ion battery which will give you several hours of working away from the main source of electricity. In terms of connectivity, this ACER CHROMEBOOK CB5571C4T3 laptop PC is equipped with Bluetooth 4.0 interface syncs with compatible devices; USB 3.0 port to maximize the latest high-speed devices; USB 2.0 port to connect more accessories and peripherals; Next-generation wireless connectivity; Ethernet LAN port; and HDMI output expands your viewing options. The ACER CHROMEBOOK CB5571C4T3 laptop PC is powered by Google Chrome operating system. The laptop PC measures about 1 in x15.1 in x 9.6 in and weighs about 4.85 pounds. You can have this computing device at the price of $ 239.99. 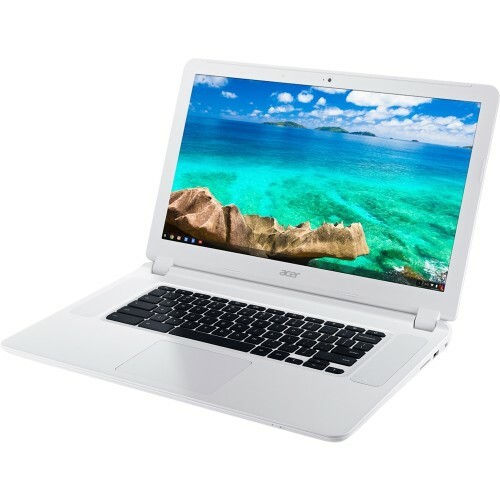 Other devices in this price range include ACER CHROMEBOOK CB5-571-C4G4 and Lenovo G50 - 80E301Y7US.